You better make sure you're confident in your questions when you're talking to Doc Rivers. It is arguably the job of the sports media to cover the ups and the downs of professional sports teams. That commitment to all that goes on around a team is likely to ruffle a few feathers, unfortunately. All one can really expect is fairness, since no one wants to be unfairly treated, especially in a medium that’s distributed to others. Doc Rivers on Twitter: "After games I’m going to blast the reporters. From this day forward, whoever asks the worst question I’m blasting." Doc Rivers: "I’ll never read anything because I know how mean Twitter is." 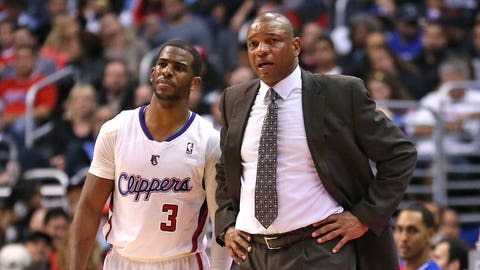 Doc Rivers on going to Dallas: "They booed DeAndre, Blake and Chris last year when they shot free throws. They’re just going to boo louder." The Mavericks famously thought they had a deal with Jordan to come to Dallas as a free agent this off-season before the Clippers center changed his mind and stayed with Los Angeles. Want stories delivered to you? Sign up for our NBA newsletters.